When I see a carpet of dandelions, I am immediately grateful. Grateful for the beauty, the food (for us and for the bees), and the medicine they provide our home. Their mild flavor gives the creative cook ample opportunity to experiment and play in the kitchen. 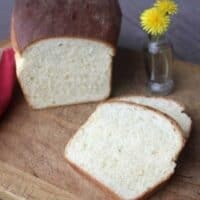 This dandelion bread is a simple recipe and yet full of flavor and a great way to get some experience with foraged food recipes. First, forage from unsprayed areas. 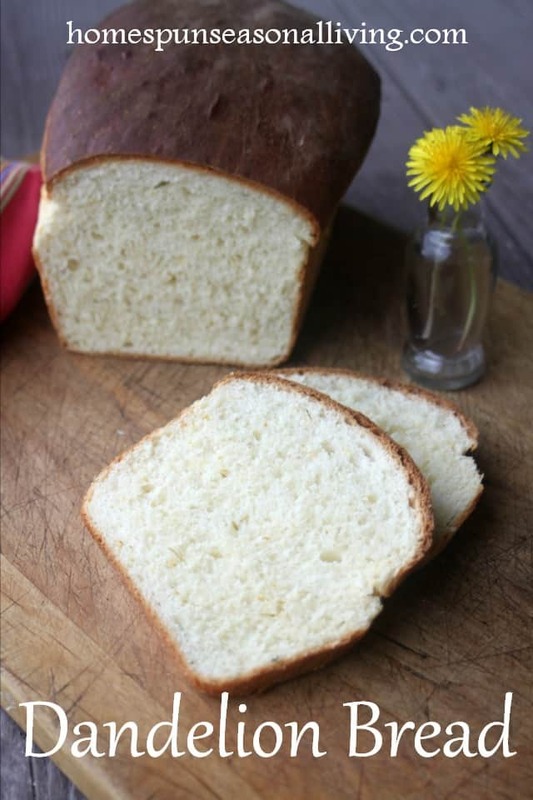 No need to bring herbicides into homemade bread. Second, harvest the blooms when they're fully and gloriously open. Then give those dandelions a wash to get rid of any grit, bugs, and other less than desirable items. 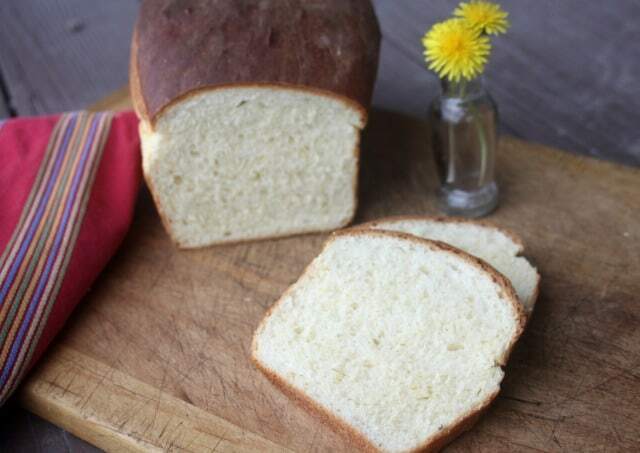 For this dandelion bread recipe, only the yellow petals are needed. Skip the green bits as they can be on the bitter side. Simply hold the dandelion by the stem and snip the petals off into a bowl. A tiny bit of the the green bits won't hurt anything but try to get mostly just the yellow petals for optimum flavor. The dandelion petals will give the bread a mild honey flavor, which is heightened with actual honey in the dough. The petals do show in the final bread but no one is going to eat this bread and immediately guess it's made with dandelions. Because the flavor is mild, choose a mild flavored flour. Rye, for example, will completely overpower the dandelion flavor. Honestly, go for the all-purpose or plain old, white bread flour here. It's not as healthy but this doesn't have to be a regular part of the diet, either. Consider it a treat. This is a soft bread great for simple sandwiches – think peanut butter and homemade jam. It's not likely going to hold up to a hearty Reuben. This does toast up delightfully making it ideal for breakfast with some eggs or simply slathered with butter for a quick snack. It would also, likely make great french toast. Forage the backyard weed and make some homemade dandelion bread that is perfect with breakfast eggs or in the lunch box peanut butter and jelly sandwich. Put the dandelion petals and milk in a small saucepan. Heat the milk just until it scalds. Remove from heat. Let cool to about 110 degrees Fahrenheit. In a large bowl, combine the water, honey, yeast, and milk. Let sit until foamy. Add the butter and eggs to the yeast mixture. Beat well. Add 1 cup of flour and the salt. Continue adding flour until a soft dough forms. Turn out onto a floured counter and knead until soft and elastic. Put in an oiled bowl and turn to coat. Cover with a towel and let rise until doubled (60-90 minutes). Punch down dough and knead again, pushing out air bubbles. Form 2 loaves and place the dough into the greased bread pans. Let rise until doubled (about 30-60 minutes). Bake bread in preheated oven for 25-30 minutes or until golden brown and sounds hollow when tapped with a knuckle. Let me know how it works for you please. Enjoy. I just made this bread with my toddler. I think it will become a family staple in the springtime. It is so yummy! My husband is still struggling with the idea that I put dandelions in food, but hopefully he will get over it. Cooking with dandelion is something I have wanted to try for a while now. I have roots in the dehydrator to try tea, and cooked up some greens with some other sautéed vegetables for dinner. So far this bread is our favorite. Oh I’m so glad to know that you made and enjoyed this bread. Thank you so much for letting me know. Found this while looking for dandelion recipes – Thanks so much for sharing! Currently making dandelion jello. Making bread with dandelions is now on the list of must do! Only it will be gluten free and dairy free (thanks to Celiac and dairy intolerance). I know our children will love it! Is there a way to convert this recipe to my bread maker? I’m sorry, Patricia, I don’t know. I’ve never used a bread maker. I imagine it can be done but I don’t know how. I know that’s not helpful.